For once, in a week of overcast skies, the afternoon sun is shining through the clouds. Three comedians, one of whom is a little grumpy, are on Lothian bus number 26, heading towards Edinburgh’s Portobello beach. Alex Horne, John-Luke Roberts and Jonny Sweet (the grumpy one) are here as representatives of comedy stable, The Invisible Dot, which this year has made an effort to extend the Fringe beyond the city centre, opening a one-night-only show, The Invisible Dot Club: By The Sea, somewhere in Portbello. The exact location of the show is still a closely guarded secret, so instead of going for a sniff around, we’re off on a straightforward jaunt to Portobello beach for some classic seaside fun. Despite Sweet’s initially aloof demeanour, the foppish young comedian eventually admits some level of excitement when badgered by the twin enthusiasm of Horne and Roberts (Roberts: ‘That was classic peer pressure, Jonny, classic peer pressure. Two people said they wanna play with castles and then you change your mind’). 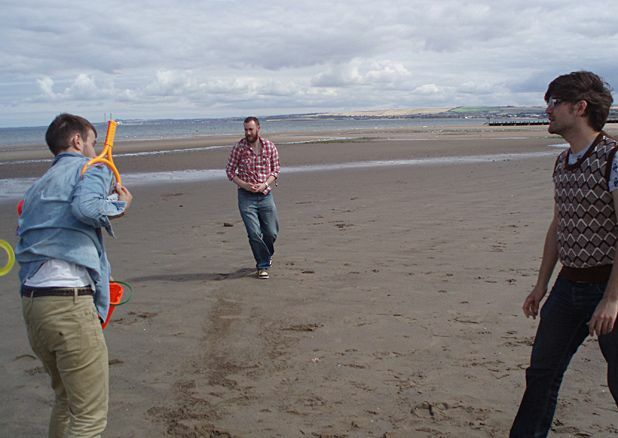 Arriving at the beach brings out a slightly competitive aspect in our comedians. Roberts and Horne play a brief game of bat-and-ball, which ends with Roberts throwing a strop and stomping off down the beach to build a sandcastle on his own, Sweet takes his place in a game that is soon aborted when Horne, through over-enthusiasm, manages to break both bats. The rivalries persist on the bus home, with Horne using his experience on TV show The Games That Time Forgot to devise an activity involving the bat-less balls rolling around on an up-turned frisbee, eventually settling on the catchy title, ‘They Must Not Touch (And Yet They Must Move)’. As the day draws to a close, everyone shakes sand from their shoes and waves goodbye. Each of our comics has been pre-occupied to a degree with the next few weeks’ solid graft, but it was nice to get out and enjoy the restorative effects of a stiff sea breeze. We’ve included the best chat from a day well spent below. LIST: What’s your favourite beach activity? Alex Horne: I’m quite a fan of the bat and ball. AH: Yeah, that’s great, I love that … We’ve only got two bats? Jonny Sweet: Two bats, two balls. AH: So two of us play a game, the other one … plays catch. I’d quite like to use a bat. John-Luke Roberts: Alex, this is quite up your street, with your Games That Time Forgot show. AH: Yeah, I did a TV programme about old sports. JLR: Bruce Forsyth – he’s an old sport, isn’t he! AH: [spots a joke shop out the window] That shop there sells jokes. JS: Oh yeah, so it does! That’s amazing. JS: … if you saw loads of comics coming out, yeah! JLR: All the big ones, lined up outside. AH: [noticing the shop also sells masks] Oh, I need a mask. AH: Just to cover my face. Wake up my baby. AH: Like he fancied you? JS: No, I don’t think he fancied me! AH: Cos people do, don’t they? JS: There was something. There was a moment. AH: No, I know what you mean. There’s a flicker of intelligence. I can play games with him. He hides. LIST: Is he any good at the bat and ball? it away, because that’s just what he does, he throws things. But everybody laughed, and now he knows that’s funny, so every time someone gives him a flyer, and of course they give it straight to him, he throws it away. JS: Do you still have to laugh now to make him feel good. AH: I think it’s still funny! Especially when it’s someone quite earnestly giving him a flyer. JLR: [to The List] Can we answer some questions about the coalition government? LIST: What do you think of the coalition government? JLR: I love it. Jonny, I voted Conservative because of you. And the documentary you did [actually a dramatisation, When Boris Met Dave]. AH: My dad just joined the Labour Party. LIST: We may have to say you were dictating the tone. JLR: Well, put that I said, ‘he said, ironically,’ ironically. He said, ironically. LIST: How is everyone feeling about their show? JLR: I’m feeling quite sick, ahead of my show. JS: I used to get diarrhoea before a show. AH: What is diarrhoea again? Slippery shits? JS: I’ve had it a couple of times, so far. JLR: So far … in your life? JS: Well, not on the bus! I used to be sick before every show I did. JLR: That was to lose weight though, wasn’t it? JS: Yeah, my weight was a terrible issue … I also have natural shakes. AH: And you’re a quarter deaf, is that right? JS: Yes, and I had grommets. JLR: Wow, you’re a real success story. AH: My cousin wore callipers when I was little. AH: … on your legs, yes. JLR: I couldn’t speak till I was five. JLR: No, that’s true. I made noises, but I didn’t really make any words. JS: What sort of noises? JLR: Aaooaeughal. I thought I was speaking. AH: What did your parents think? JLR: They thought I was stupid. AH: And now you’re a poet? AH: Sort of. A comedian. JLR: Yes, well. Aren’t jokes poetry, really? LIST: That sounds like a sign-off line. JLR: You could say at the end, that comedy is like a beach. JLR: Oh no, don’t explain it; just have that as a pullout quote. Comedy is like a beach. John-Luke Roberts, Pleasance Dome, 556 6550, until 30 Aug, 8.10pm, £9.50–£10.50 (£8–£9). The sextet fronted by the inimitable Alex Horne performs a medley of retro jazz-swing and big band music plus stand-up, performance and musical comedy.